'S e dùthaich eileanach anns an Roinn Charaibeach a tha ann an Naomh Crìstean agus Nibheis neo St. Kitts agus Nevis. 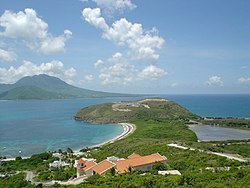 Tha dà ainm oifigeal aice anns a’ Bheurla: Federation of Saint Kitts and Nevis agus Federation of Saint Christopher and Nevis . Tha i na laighe anns na Lesser Antilles anns a’ Mhuir Chairibianach. Tha Saint Eustatius, Saba, Saint Barthélemy, agus Saint Martin anns an taobh tuath agus tha Antigua agus Barbuda anns an earra-thuath. Anns an taobh a deas tha na h-eileanan iomalach Redonda agus Montserrat. Tha dà eilean anns an dùthaich seo, an t-eilean nas motha: Naomh Crìstean, agus am fear nas lugha: Nibheis. Tha am prìomh-bhaile na laighe anns an Naomh Crìstean agus tha an riaghaltas stèidhichte an seo cuideachd. Thàinig an t-ainm Naomh Crìstean bho Christopher, (ainm goirid sa Bheurla: Kit, neo Kitt). Chuir Cristoforo Colombo an t-ainm "San Cristóbal" (Spàinntis) ris an eilean seo. Tha Nibheis na laighe trì cilemeatair san earra-dheas Naomh Crìstean. Thàinig an t-ainm aca bho "Nuestra Señora de las Nieves" (Spàinntis). 'S e an dùthaich as lugha anns na h-Aimearagan a tha anns an Naomh Crìstean agus Nibheis a-rèir farsaingeachd agus àireamh-shluaigh. Oirthir an eilein Naomh Crìstean. ‘S e Nibheis air an làimh clì. ↑ Tha an dà ainm anns a' bhun-stèidh Naomh Crìstean agus Nibheis . Air a tharraing à "https://gd.wikipedia.org/w/index.php?title=Naomh_Crìstean_agus_Nibheis&oldid=457026"
Chaidh an duilleag seo a dheasachadh 6 dhen Ògmhios 2014 aig 10:47 turas mu dheireadh.